Tales of Berseria (game, 2016). A role-playing video game by BANDAI NAMCO Entertainment America Inc./Bandai Namco Games. Developed by Bandai Namco Studios, BANDAI NAMCO Studios Inc., BANDAI NAMCO Entertainment, Bandai Namco Games. Official Trailer. Tales of Berseria is a role-playing video game by BANDAI NAMCO Entertainment America Inc. and Bandai Namco Games, developed by BANDAI NAMCO Entertainment, BANDAI NAMCO Studios Inc., Bandai Namco Studios and Bandai Namco Games. 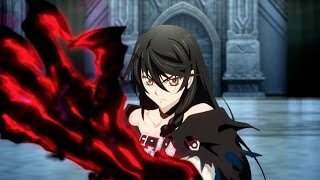 Tales of Berseria - "The Calamity and The Blade" Trailer | PS4, Steam. Berseria takes places in the Holy Midgand Empire, a powerful country that rules over this world's archipelago of a continent. The game's world is shared with Tales of Zestiria, although the events occur before the latter. There are countless numbers of islands around, and Midgand's rule crosses even the seas. Areas of land and islands in the game are divided into "territories." Along with humans, one of the other main races is the Malakhim (singular: Malak), supernatural spirits whose wills are sealed and used by humans as slaves to utilize their magical abilities after being made visible to even normal humans due to the Advent, an incident 3 years prior to Velvet's escape from her prison. Throughout the empire, a disease known as Daemonblight causes those infected to lose their humanity and sense of rationality and transform into monsters known as Daemons, who pose a threat to the world. Along with the rulers of the Holy Midgand Empire exists a theocratic order known as the Abbey, who are of great political and religious importance and are influential in imperial affairs. The Exorcists, soldiers from the Abbey, are tasked with bringing peace and order by purging the world of Daemons and are willing to go to extremes to reach their goal. When she was a child, Velvet Crowe and her younger brother Laphicet were saved by her brother-in-law Artorius when a Scarlet Night happened and daemons attacked their village; Velvet's pregnant older sister Celica was killed during the event known as the "Opening". Seven years later, Velvet takes care of her sickly brother with Artorius. The Scarlet Night returns, with the entire village succumbing to the Daemonblight: when Velvet finds Artorius, she sees him sacrifice her brother as part of a ritual, known as the "Advent". Artorius attempts to use her for the Advent as well, but she fights back and the Daemonblight possesses her arm, mutating it and turning her into a Daemon called a "Therion", with the ability to absorb Daemons. In a rage, she slaughters the nearby Daemons before passing out. She awakes in a prison for Daemons on the island Titania, swearing to kill Artorius and avenge her brother's murder. A group of beings known as Malakhim, who were previously only visible to "resonant" individuals, become visible to most people of the world after the "Advent". Over the next three years, Artorius forms the Abbey to bring peace to the Holy Midgand Empire, becoming the Abbey's "Shepherd" and is seen as a savior by the people for establishing the Exorcists using the malakhim. 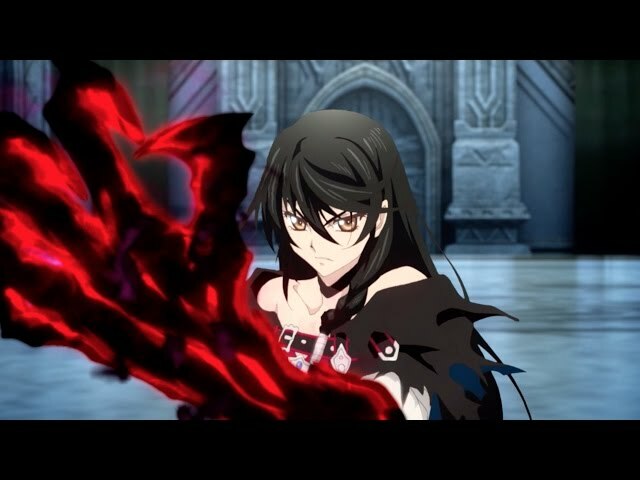 Tales of Berseria is a role-playing video game, where players navigate the game's world through the game's characters from a third-person perspective. As with previous Tales games, characters can interact through Skits, animated clips that play outside cutscenes and battle: characters are represented by head-and-shoulder portraits, and conversations can range from serious to comedic. New to the series' Skit systems is a cut-in effect, where at certain moments within skits characters in various poses will appear in response to the dialogue. Tales of Berseria was scheduled to be released by BANDAI NAMCO Entertainment America Inc. and Bandai Namco Games on August 18, 2016 (Japan), on January 24, 2017 (North America), on January 26, 2017 and on January 27, 2017 (Europe, international).